I just installed Blogger app (never knew it existed) so this will be my first testing post :). I'm actually in the process of editing this new hairstyle. This hairstyle is super quick, only took me 10 mins. I actually had a little over an hour to get ready for a formal dinner with some friends then I realized that I spent most of the time on my face and with only 15 mins left, I came up with this quickie hairdo. It looks elegant & classy enough for any formal event. I also got loads of compliments on this style so I can't wait to share with you guys the steps on how to achieve this look. Please stay tune for the tutorial! Beautiful. It's perfect for a wedding or a fancy event. 15 minutes to think up such a hair style?? O.o woah, u're pretty amazing! Cinthia! 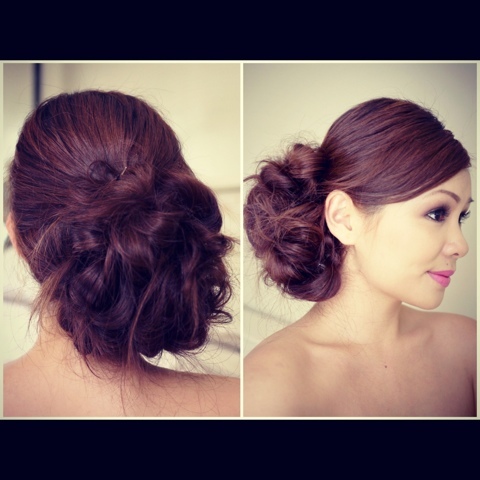 You're my favorite blogger for hairdo's!! I never had confidence to do any of these and you make it really clear and do-able! I'm a fan, and I am sure my girlfriends are catching up too!